I just replied to an email I had missed last month from Will at Charlotte Fence Company. Will looked at the source code for GrowMap and when he saw nofollow tags in it he thought we were not really Certified DoFollow. It is easy to see how someone might think that so I want to share more details with my readers. The best WordPress Themes automatically nofollow certain unimportant fields and since we use Thesis that is true here. The nofollow tags Will is seeing are on the Twitter links, dates, and reply links in the comments – not on your anchor text links to your sites. If you have the toolbar turned on (click on the word SEOBook on the far left of the toolbar to toggle the tool off and on) and click on the red Highlight NoFollow Links icon, all nofollowed links on the page will be highlighted in red. Our source code is visible, but if you want to see the source code on sites where it isn’t use this View HTML Source Code Viewer. Some sites move their source code off-page as part of advanced SEO strategies. We recommend you check the status of the many links on your blog or site using the free SEOBook Toolbar of one of the other alternatives. It is not a bad idea to nofollow unimportant links. NEW: Have you seen Kikolani’s latest DoFollow list? Thanks for this great info. I just started using seobook. It’s a great tool for seo and you can say it’s the “swiss knife” when it comes to seo. One question though, what do you think of seoquake? most of the people I know tend to favor seoquake. But in my experience, it’s a pain if it’s on when you are creating/manipulating your website. i’m using the same tool and i’m very happy with it too.. i mean as you said, it’s kind of hard to remember all of those nofollow sites, and this tool basically points them out to you.. I use SEO quake for it and nodofollow (works on the new firefox now). I like seo quake because it does a strikethrough the nofollow links. That’s a bit less in your face and it’s not that annoying to leave on. Usually I use firefox add ons to check dofollow nofollow sites including pagerank .. The idea was so simple, if you’re a do follow, you’ll receive a good reputation. Actually, this thing is very necessary especially in blogging. Every blogger really aims to be one of the most followed. That’s why they are working so hard to come up with great ideas. There’s no way to leave all links do-follow, and there’s no point to it. I can understand Will though when that much red struck him on your blog. I have first time read about SEOBook Toolbar.I will sure explore the anatomy of the tool. From 2011 Google has considered the links from twitter for ranking of sites and Google award ranking to the sites that have do follow links. Yep, that is one handy tool to use. I use it all the time for SEO. I think SEOBook’s Nofollow detection is better than SEOQuake. Then again, it is all a matter of personal preference. SEO Toolbar is an awesome addon, there are more as well….’Search Status’ addon displays Google PR and Alexa Ranks and also highlights nofollow links……and if your looking for a lightweight addon which just tells you about Dofollow/Nofollow, then go for nodofollow addon in Firefox. I use search status as well. It has served me very well for this sort of thing. I’m not sure if I downloaded on its own or not though, I have a ton of SEO plugins. As an alternative to SEOBook, the SEOmoz toolbar also allows you to easily identify no-follow links – both are useful in terms of saving time. Much quicker than searching for the tags in the source code. I totally agree on this. I actually found out about SEOBook and SEOmoz lately. They definitely gave me quicker and easier work. I don’t have to exhaust myself looking for quality links. I usually view the page html source. The problem with viewing page html source is that even dofollow blogs need to nofollow unimportant links so you may THINK they’re nofollow when they aren’t. I’ve been using the plug-in Luv on my page and I found it very useful. I get new content from readers make comments and this is very important to climb in the rankings. Thank you for using this plug-in useful. I used the tool/plugin called grease monkey, it does the same thing as the rest. Just highlights no follow links in the color you choose. Great tips though, thanks. I know there’s a wordpress plugin called External nofollow that does all the nofollows for external links automatically. Pretty handy tool. We are not a fan of nofollow because it makes it harder for the search engines to know what a site is about or ever appear for appropriate searches. Dofollow links are important but more so is to have a nice variety of do/nofollow in a link profile otherwise it’s just a massive red flag to Google. Thanks for posting this kind of blog post! Your post about Verifying What is Do Follow versus No Follow is very informative. I can get useful tips from here. I currently use a Firefox tool called “NoDoFollow”. It colours in links blue for no nofollow and red for nofollow. It can be a lot safer than using SEOQuake as its only purpose is to categorise links. There are tool for each browser that can verify the no follow and do follow links. For FireFox Search Status is software that is helpful in this regard. This is a great tool. I will use it on my blog. I am using this tool. and must say its of great help. Now i dont’ve to go to viewsource to find nofollow so its saves time. My favourite is the Firefox addon from SEOMoz, highlights the nofollow in pink and you can leave it on when it switches between pages so you don’t have to keep pressing it. That’s a good point, could I also mention that there are many add-ons for Mozilla firefox that help with No-follow detection. Here is the information interesting and useful that you share. Leave comments in dofollow blogs is one of the best ways to increase my website.otherwise Commenting is a great way for me to meet new people and make connections, share information. .-= Pauline´s featured blog ..Nice apartment with vue on Eiffel Tower in Paris =-. I’ve been using the SEO toolbar on my firefox so that it wouldn’t mess up the view on my regular browsing during my personal use. Yes, it is easy to turn it off from View-Toolbars-SEO, but I’d rather have one browser dealing with regular stuff and one with blogging. I personally like the tool bar. Not only does it show you No-Follow links, but it also gives page rank and so many more factors that you have to consider. It is a definitely a good resource to have. .-= KyAus @ Those.Tips´s featured blog ..Webmasters Dont Get Scammed =-. Most of the peoples are going to choose do follow but still I am with no follow & also my blog is having no follow because I really hate spammers & no follow is a good for keep spammers away from you. & if any one can have no follow then he will get only real comments. It blows my mind when a spammer takes the time to leave a real comment about how they are nofollow because they hate spammers. Really? How about STOP SPAMMING? Really decent little plugin, it has always been a real pain for me to manuall check the code, especially since some people use the tag in the header, some on each individual link…so this definitely helps alot. Thank ya! I really like the nodofollow plugin for firefox. Wow…Really it is very useful post & I am new in SEO field and from last various months I am trying to find out exact difference but not get success in that, but now I get everything from your post & thanks for sharing such a informative post. Thanks for this useful information. I have downloaded Seotoolbar, tried it and it works perfectly well just as you explained. It is a huge knowledge gained in split seconds. Cheers. No follow and do follow is quite helpful in SEO as the links with do follow will help you indexing on top on the Google while no follow will help only in getting traffic. I have never heard of the SEOtoolbar. I will definitely look into this. .-= Mike´s last blog ..Get IPcop’s VPN To Work With Vista and Windows 7 =-. I like DoFollow Blogs! I always commenting on DoFollow blogs because the backlinks are very valuable.Commenting is a fantastic way to meet new people and make connections. So, here I am out on the net randomly visiting Do-Follow blogs. Your blog is very informative. I edited your comment to give your site appropriate anchor text. Do read my post about KeywordLuv I’ve featured in CommentLuv in this reply to find out why that is important and how it works. I just discovered yesterday that both the SEOBook Toolbar and the SEOMoz toolbar both mark the comment links in as nofollow even though there is no rel=”nofollow” in them. We don’t know why. The NoDoFollow Firefox plugin shows them as DoFollow but Kristi aka Kikolani tells me that plugin only works in older versions of Firefox. I’d just like to note that it’s also worth the time and effort to mark the about, privacy, terms etc. pages as “no follow” as well. Why you still cannot do this in WP as a default really boggles my mind! It doesn’t appear that the folks behind WP want to make optimum SEO the default. I believe the Platinum SEO plugin allows users to do that without having to hardcode the pages. .-= growmap´s last blog ..Affiliate Tips Tuesday: Holiday Promotions =-. I use Seoquake and it has a line through all nofollowed links. Quick question -wWhy do you prefer the Seobook plugin over Seoquake? There are often multiple tools that do about the same thing and not enough time to try them all. I do not know that I would prefer SEOBook over SEOquake because I have not used SEOQuake. I would love to hear from anyone who can compare them to see what they can share. I commend you on providing HomeSchooling Resources as I believe that wisely done home schooling is far more beneficial to children. Word of Mouth will definitely help you increase visibility for your resources and make sure more parents can use them. .-= growmap´s last blog ..Word of Mouth Marketing =-. Wow, thanks for the awesome free tool and link to the list. .-= Linda Dobson@Miraclesuit Swimwear´s last blog ..Why I Love Miraclesuit Swimwear =-. You know I never new you could use the SEOBook tool. I’ve had the tool installed for months but some tools have so many features. Bit like a washing machine. You only use 10% of what it can do! I feel exactly the same way about the SEOBook Toolbar (and many other tools I use). That is why I am so big on collaborating – so we can share what we already know and learn much faster. .-= Gail @ WOMM´s last blog ..Keyword Tags, MetaTags, Tags: How Many Are Best? =-. I just got an update for the firefox addin, it just keeps getting better and better. Another tool I use is the basic Google toolbar which quickly shows the pagerank for a website. Rank Checker and SEO4Firefox are my two most favorite Firefox addons. I also recommend SearchStatus plugin, since it shows the PageRank and Alexa rating of any page that you are currently on. .-= KD@Solar Pool Heaters´s last blog ..Inground Pool Solar Heating System =-. .-= James R. Lee´s last blog ..Dude… I’m old. =-. .-= Paul @ Indoor Bicycle Trainer´s last blog ..Do Follow, Comment Luv, Keyword Luv =-. Although your explanation makes perfect sense, it is possible you could be wrong in your conclusions. There seem to be some rumours and tests showing that if a link is nofollowed somewhere high up on a web page, all subsequent links to the same URL will not be followed (even if the link doesn’t contain the rel=nofollow). It’s something I will be testing soon but you might want to run some tests as well. Why is it important? Because the gravatar links (which are always nofollowed, even if you use a no nofollow plugin) appear before the dofollow links on all the blogs. .-= Tom@Websites for Accountants´s last blog ..Search engine optimisation for accountants – the basics =-. You really help those starting out in this blog…You have good tips about marketing strategy. .-= joan´s last blog ..3 Simple Things to Try To Improve Your Marketing Results =-. I use an excellent Firefox program which can immediately identify nofollow and dofollow links for me. If you are using firefox browser, you can try out NoDoFollow Addon, which highlights links in a page according to nofollow / dofollow status. .-= camelia123´s last blog ..Tuaw Fact Check That 10 Reasons To Pass On The Ipad =-. .-= patrick@bungalow zwemparadijs´s last blog ..Bungalow Zwemparadijs =-. I personally use the SEOmoz toolbar which works like the SEOBook toolbar but has a few more functions. I like it because it highlights nofollows in pleasant pink instead of red. Overall, a very informative post that shows the SEO newbie how to find dofollow blogs. I have been using the SEOBook tools for around a year now and love them, with tools like this it’s important for blogs like mine to let visitors know that your blog is Do Follow on the third comment vs the first and every comment. The striking big red UH OH screams No Follow which might throw some visitors of. .-= Extreme John´s last blog ..A Day in the Life of Extreme John Episode 7 [video] =-. When I go around commenting I don’t worry too much about whether or not someone is truly do follow or no follow, because I believe comment link building isn’t the best strategy. Instead, I prefer to write comments that the blog owner will consider valueable and come visit my blog – bam new reader. And then other readers might read my comment and like what I have to say and visit my blog as well – bam another new reader. .-= Chris Guthrie@Make Money on the Internet´s last blog ..phpZon Pro Plugin Review and Contest Giveaway =-. Welcome and thank you for sharing. As more and more quality blogs exist there won’t be time to read and comment in them all. I know that is why I now focus on Do Follow, CommentLuv, KeywordLuv blogs and that is probably why this post is popular. Consistency is key to success so it simply makes sense to consistently interact with specific blogs and to do that we have to have a way to prioritize them. It isn’t so much the actual Do Follow links as it is a common way of looking at life. .-= Gail @ KeywordLuv´s last blog ..KeywordLuv: How Using It Benefits Us All =-. As the creator of SearchStatus, I’m sorry to hear you have such a poor opinion of it. I certainly don’t see SearchStatus as spyware, and neither does Softpedia.com who reviewed it (or Mozilla, for that matter). The truth is that unless you contact Alexa with your current URL, you cannot get data on that URL – it’s purely for that reason that the request to Alexa is made. I’m just trying to be upfront about it. However, if you want to keep any sites private, you can add them in the SearchStatus Options and they won’t be reported (and you won’t get any stats). HTTPS sites are private by default. You can also disable Google and Alexa so only the nofollow functionality is available, in which case SearchStatus won’t make any external requests. .-= Craig Raw´s last blog ..Quirk Celebrates More Google Analytics Qualifications Than Any Other SA Agency =-. Thank you for taking the time to share more details on how Search Status works. As you know the use of tools that track our movements cross the Web has benefits as well as drawbacks and that is all too complicated for me to go into in a comment reply. I will share that yours is certainly not the only widely used tool that does this and many people use one of the most popular of all toolbars and it tracks at least as much and probably more. It is wise to know what any tool we choose to install is doing; however, that is not a simple thing. We as bloggers can decide to install Alexa tracking (and thereby most likely improve our Alexa rating) or forego using it because we prefer not to be continually tracked. As someone highly interested in marketing the statistics these tools accumulate can be useful; they can also be an invasion of our privacy. They are, as the saying goes, a “two-edged sword”. .-= Gail @ KeywordLuv´s last blog ..Search Engine Positions: Easy Free Ways to Track =-. Sure, I agree. The truth is that we’re tracked by web analytics and other software all the time – the dividing line in my eyes is whether the tracking is personally identifiable. I was not aware that the SEOBook Toolbar reports to Alexa or any of the others but they are in the Toolbar so that is something I should check into. Do you know definitively that they also report the same way Search Status does? Every one of the requests below the first one reports the current URL (example.org) to another service. You’ll see Alexa contacted towards the bottom, through xml.alexa.com. The frustrating thing is that by trying to be honest about it, SearchStatus is branded as spyware, yet SEOBook discloses nothing and does more of the same. Thank you for calling me on my error. I was not aware that the SEOBook Toolbar was also reporting the same way your tool and many other toolbars do. We are all always called to make decisions about whether we will forego the benefits of a particular tool or service or accept what else it does in order to use it. Unless anyone can identify a tool that does not track us, whether you choose to use SEOBook or SEOQuake or Craig’s Search Status is a personal preference. If you want to know more you might want to watch this Search Status Video on how to use it. I will update each of my previous comments to clarify that these tools are all using the same type of tracking. Now that’s customer service! I love seeing company heads, or even figure heads sometimes, in comments. Thanks for the update Craig, I figured it wasn’t done purposely…too many try the sneaky route, get caught, and are never seen again. .-= Dennis Edell´s last blog ..$100 – 10 Winners – Comment Contest! ‘Till Months End… =-. I want to clarify that it isn’t really sneaky but it IS a complicated issue and it is something that some Internet users would prefer to avoid. I know top SEOs who don’t use the Google Toolbar because they did not like all their online activities being tracked. If none of that gives anyone pause consider the warning the EFF issued about the Search Across Computers feature. I do hope Internet users will at least draw the line on the safer side of THAT issue! DoFollow vs NoFolllow is a long going debate. I am currently NoFollow. Haven’t decide if I should go DoFollow. DoFollow encourages comments but Spams too and also most comment for Links. .-= Chasey@women only´s last blog ..10 Must Have Gift Ideas For The Wedding Party =-. May I offer my alternative view? We decide which blogs to comment in based on whether they are dofollow but we do NOT comment for the links – we comment to support our community and understand each other better. Behind the decision to go DoFollow CommentLuv KeywordLuv for many of us is the decision to join a blogging community of people who believe in being generous instead of self-serving. MOST SELFISH: A blogger who writes about or quotes you and does not link to you. SELFISH: A blogger who writes about or quotes you and links to you but nofollows that link in the body of their post. GENEROUS: A blogger who links and attributes when writing about or quoting you and provides the most valuable link of all: one with your best anchor text. MOST GENEROUS GROUP: Bloggers who are generous with anchor text links and choose to be DoFollow and use CommentLuv and KeywordLuv. My position is that I only have so much time so I am going to focus on the most generous group and I don’t mean by commenting only. I mean they are the blogs I read more often. They are the bloggers I will write about and link to most frequently. These are the people I choose as my peers and friends. They understand (or are learning about) the big picture and it benefits the world more for us to support each other’s efforts than it does to use our time in other ways. That’s an informative explanation for dofollow vs. nofollow. I didn’t know about PageRush’s dofollow tool and list, might use it sometime soon. Since SEOQuake is probably one of the most popular webmaster plug-in, you might want to publish a quick howto for SEOQuake users too. .-= Chris@Traffic Ultimatum´s last blog ..Traffic Ultimatum – More Traffic = More Money =-. I know that SEOQuake is similar in many ways to the SEOBook Toolbar. Since I do not use it and don’t have time to compare them I would be happy to publish a guest post about SEOQuake. I would be interested in a post similar to this one about how to display the same information or posts about any other functionality available in SEOQuake. The author is welcome to include their affiliate links, if any, for writing a quality guest post. I really need to write that post about why we should never object to someone using affiliate links as long as their recommendations are sincere and their research valuable to us. Ethical affiliates only recommend what they truly believe in and many recommend SEOQuake because they use it regularly. You have described very well about Do follow and No follow and its very easy to understand about it from this post.I think now I have cleared my some doubts.I like that you provide us such valuable information. I know one more way to find the no follow links. In fact i usually use it. First step is just find any comment on the blog which you are reading and do right click on that link. Second steps go to property and you will find a dialog box in which you will get every detail about that particular link. Yes, that is another way to determine whether links are no follow or do follow. It is much slower than being able to highlight them all at once though. 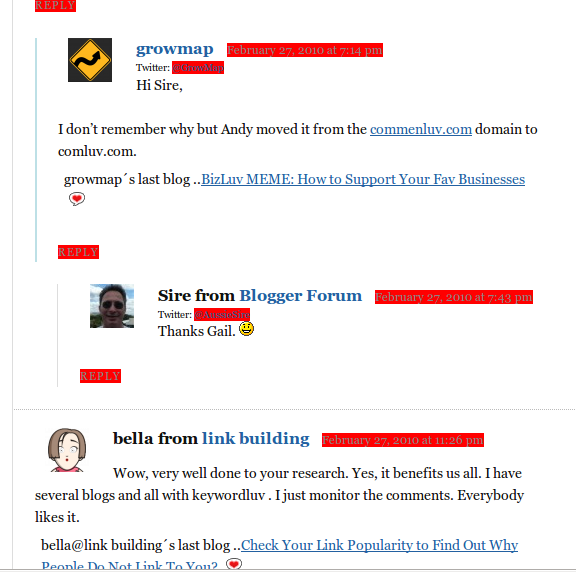 The highlighting helps especially in blogs that use a plugin like Lucia’s LinkyLuv that can be configured to change your links from no follow to do follow after a specified number of comments. Since you have a business, do be sure to read the BizLuv MEME posts too. The post about KeywordLuv I’ll place in the CommentLuv section of this reply has far more information about Do Follow as does the most popular post on this blog specifically about Do Follow. That post is currently the most popular post on this blog and has stayed in the Most Popular section (at the top right of each page) for as long as we’ve used that plugin. I, too, learned something about CommentLuv and do follow. I was looking for information because I’m trying to let people know of the inexpensive blogs I’m installing for organizations. .-= Lane Lester´s last blog ..Testing Windows Live Writer =-. I hope you are installing them on self-hosted WordPress, optimizing them for SEO, and making them comment and business friendly. I wrote more about that in my Successful Blog post. I highly recommend plugins related to do follow. You can read more about them in my KeywordLuv post. Also see the post I shared in CommentLuv in this reply. It explains how blogs can support their favorite businesses, causes and other bloggers. .-= Gail @ KeywordLuv´s last blog ..BizLuv MEME: How to Support Your Fav Businesses =-. What I am curious about is how and why Akismet would flag our Grad comments as spam if the individual blogger has not so designated the web address for toysperiod for spam. Perhaps Akismet has changed something today. Your comment test appeared in my blog without having to be fished out of the SPAM section. The value of Akismet that is also causing your students headaches is that it identifies SPAM based on what OTHER bloggers have flagged. As you can see this has its pros and cons. If anyone knows how many bloggers must flag a commentator as a spammer for their comments to be automatically relegated to the SPAM section please do share. Knowing will save me much research time – and that is something useful for all of us to know. If you have a link to that information feel free to add it to the comments here. (Relevant links are always welcome here.) I would hope that it takes more than one or even a handful of bloggers to mark a commentator as a spammer. I do hope bloggers review what is in their SPAM section BEFORE they delete the comments. I fish at least 2-3 valid comments including some from my regular commentators who have high quality blogs out of the SPAM section just about every day. .-= Gail @ KeywordLuv´s last blog ..My Review of The New Community Rules =-. Test comment using the @lindachristas.org email address Beth has used to comment here before. .-= beth charette @ Lego Sets´s last blog ..New Product: LEGO 6882 Walking Astro Grappler Classic Space Walker Set 85 =-. The above is a second test comment using Beth’s other email address. This confirms that neither of those email addresses or the Toys Period URL are being blocked. Although they are being flagged as SPAM they can be seen and approved by any blogger who checks for valid comments before deleting SPAM. I do that every time and I recommend all bloggers do too because I usually do find real comments in among the obvious SPAM – even comments from my regular commentators with major blogs. It IS possible that her IP address is being blocked by Akismet and to test for that I need Beth’s assistance. Test comment using the @yahoo email address Beth has used to comment here before and the ToysPeriod URL. The above is a test comment I created to verify that Beth’s comments from that email address using that URL would come through. The comment DID get flagged by Akismet as SPAM but I was able to approve it and here it is. My big problem is seeing something, then adding it without understanding what it does and how it might affect other things. I am beginning to understand do follow and I have a plugin that it supposed to make it happen but I worry about having too many plugins. Many bloggers are running 20+ plugins with no apparent issues. The quality of the plugin and whether it is compatible with your Theme are more important than the number you’re using. I have the advantage of relying on WordPress Ninja Derek Semmler for technical advice. He installs and maintains the plugins on all of our blogs including this one. Given the huge number of plugins and constantly changing versions of WordPress, plugins and Themes it is wise to be cautious about which plugins to install. The plugins related to Do Follow including CommentLuv and KeywordLuv are some I would never do without in any blog. While Gail is correct, there is one other thing to consider. Yes, too many plugins tends to take a lot of resources and will slow down load times. There are things you can do to minimize this as best as possible is. As you become more aware of plugins, you will soon realize often times there are multiple plugins, produced by different creators, that do primarily the same thing. Do Follow is an excellent example of this. By this time, there is easily two handfuls of “do follow plugins”; some of which have different functions above and beyond just the do follow thing. Like I said, many many plugins have multiple siblings, as it were. Some coded well, some not so much. Do some research, ask around, find the most suitable one for your needs. .-= Dennis Edell´s last blog ..UPDATED – THREE Plugins Needed – What Do You Recommend? =-. Thank you Dennis for elaborating. As I know I commented somewhere, the quality of the plugin is more important than the quantity IF the plugins you use are well coded. The best way to find out which plugins are best is to read the plugins posts that serious bloggers write like the one Dennis just shared. Researching takes time and many of us compare notes before deciding which ones to use. It is never a good idea to install or download anything before you thoroughly check it out. I do not even update this blog myself – I rely on my WordPress Guru Derek Semmler to update WordPress, the Thesis Theme we use and the plugins knowing he is wise enough to research them first. If you run a Web site or blog you need to understand what is commonly called Change Management in the IT (Information Technology, i.e., computer) world. I would add a link here if I could find one that explained it simply instead of complicated it. Basically you need to document what you change and when so if there is a problem you can back out the changes that caused it. Before you make changes (like updating WordPress, Themes or plugins) do some research online to make sure others aren’t complaining of problems caused by that update. We had a saying when I worked at IBM as a computer tech: Let someone else be on the “bleeding edge” (a play on “leading edge”). In other words, don’t rush to install the latest anything in a critical account – let others find the bugs and give the Engineers and Programmers time to fix them BEFORE you install the latest thing. The same thing was true when I worked in the automobile industry. The best year model is the last year it is produced. The worst is the FIRST year because no matter how well engineered there can always unintended consequences of new concepts. Also, and this is kinda important, always try to find/download any plugins you want from the official WordPress plugin directory – http://wordpress.org/extend/plugins/ – as they do everything they can to debug and validate the plugin before listing it. Many creators give them away from their own websites; be careful there. .-= Dennis Edell´s last blog ..How Do You Cover SEO *Per Post*? =-. Sadly, the College has had to place this site off limits for our Grad Departments because Akismet is blocking a scholarship provider indiscriminately. If this is no longer the case, and you will again allow comments with http://www.toysperiod.com in the website field, we can get this site reinstated. I know you lost a lot of fans when suddenly Akismet stepped in and began blocking all our grad students who wanted to leave thoughtful comments here. Please let me know if and when you unblock http://www.toysperiod.com. If you didn’t personally tag ToysPeriod, perhaps Akismet is the source. We just don’t know. What we do know though is that Akismet has unfortunately been responsible for censuring essential academic communication. As a result of Akismet and several other such services, the US now trails the Chinese in terms of mass censorship of valuable information. This is unfortunate, since most spam originates in Asia anyway. In other words, Asia sends spam to the US, and bloggers in the US end up paying for the censoring of US citizen communication, which is exactly the goal of many Asian spammers to begin with. Even with the Chinese military censoring communication in China, still 95% of our Chinese campus communications go through. In the FREE US, because of Akismet and services like them, less than 50% of student communications survive. It is a sad sad situation. If you decide to unblock http://www.toysperiod.com, please let me know, and I will reinstate this site. Toys Period is not blocked and never has been. Their comments sometimes get flagged by Akismet as SPAM so they do not appear right away but I do rescue them. A comment from Beth Charette from LegoSets, your comment and my reply to you in KeywordLuv all contain dofollow links to Toys Period. I even added a link for you in my reply. There is another comment and link to Toys Period in a comment from Beth Charette from LegoSets in my post about Tracking Search Engine Positions. I also found another comment from Beth in my Happy New Year 2010 post that did not contain anchor text so I just added it for you. If you look at my reply to that comment I made a point of sharing with Beth how to use KeywordLuv to gain valuable anchor text when commenting. Those are the only comments I have ever seen from any of your students. I have not deleted any that I am aware of and to the best of my knowledge Akismet shouldn’t be blocking them. As soon as I submit this comment I will log out and try commenting using her information. I can not test commenting using her IP address though. I assure you I have no desire to block any of your students. If that is happening I could use your assistance to determine why and fix it. If I don’t know I assure you that many others won’t either and this problem will spread. Helping me diagnose what is happening is in the mutual good of all so please look for an email from me and work with me to find out if they are indeed being blocked so I can get them unblocked. I would be happy to write about this situation and contact Akismet or anyone else necessary to get this situation resolved. It can not be that URL in the comment field that is being blocked because your comment used that URL and it worked. It was originally flagged and SPAM by Akismet but I approved it with no problem. If you could ask your students to let me know when they have trouble commenting I am certain we can get to the bottom of this problem. They can send a Tweet to @GrowMap or use the contact information here. I am using nodofollow plugin for mozilla and it is really very good plug in for finding no follow or dofollow link. .-= chandan@work at home jobs´s last blog ..Few quality link can help you for get rank on search engine =-. The NoDoFollow FireFox addon appears to be clean of SpyWare and AdWare at least for now according to these NoDoFollow Test Results. Unfortunately any tool we use can have Spyware or AdWare added at any time so all we can do is stay aware. For me, I will stay with the SEO Toolbar because of Aaron Wall. Although I do not know him directly, I have never seen anything unethical or shady in what I have read about or by him. I respect that he clearly understands that ethics are not as black and white as many propose. Read more about this in his Ethical SEO article. Reading that article reminded me of more posts I really need to get written. There is almost always a large area containing alternatives that are best for all between any two polarized positions. I use search status for Firefox, do/no follow and a ton more. FYI – making sure all non essential links are no follow is a really good idea. Would you care to elaborate about “FYI – making sure all non essential links are no follow is a really good idea.” for Steve (who asked about that in a comment above yours) and others? Anything you would add to what I wrote? Nope, not all that worried about it. Regarding the FYI – Basically, if it’s not a link you personally insert within a post, or comment links and such, why leak the juice unnecessarily? Welcome to GrowMap. I’m sure you’ll find much here to benefit your business starting with the Best of GrowMap Internet Best Practices. There is another blog I recommend you connect with because they are very advanced at doing business online and promote green building. They use a new ecofriendly wood called TimberSIL to make almost fire-proof, rot-proof products like Exterior Shutters . I will email you an introduction to each other. You can also reach them directly through their Millwork and Molding blog and follow @GoodMillwork at Twitter. In addition to the toolbar highlighting nofollow links, it would also be nice if these tools would search the robots.txt file as well. I’ve seen some forums that offer good links only to find out the pages (mostly member profiles) were blocked by the robots.txt file. I find forums so much slower to use than interactive blogs that I haven’t spent much time in them lately except for our private blog collaboration and dropping in to research specific subjects in others. Those most concerned about verifying the status of links they are creating often share that type of information about sites that do or do not block benefits of those links. You might check my Do Follow Tools and Lists for links to information about dofollow forums. I for one salute you for continuing to be DO FOLLOW. Thanks! But I wonder why your theme makes some links no-follow. What’s the benefit of doing that? The only thing that looks at no-follow is google, not humans. And I think google said a year or so ago that pagerank still flows through a no follow link, but then disappears, so it doesn’t “save” pagerank. So what’s the benefit of making a link, even if it isn’t important, no-follow? I’m not saying there’s anything wrong with it, but what’s the point? Does my question make sense? .-= Steve@trade show guru´s last blog ..Trade Show Outboarding =-. The reason advanced WordPress Themes like Thesis would nofollow those links is in case page sculpting does work or because it used to work – take your pick. Since it doesn’t hurt anything and it might help I have no objection to Thesis automatically doing that. Whether it has any effect on anything I can’t say because I have never cared enough to test to find out – and I do have the ability to figure it out. It just isn’t a priority for me. I prefer to focus my time and efforts on what is best for all people. What I do know is that disinformation is common and there is a HUGE benefit to the few if they can convince the many (who will never verify the truth) that things work one way when they actually work another. If the majority believe that SEO doesn’t work, incoming links are not important, and pagerank is measured in a particular way, that benefits SEOs and Brands. It greatly reduces competition and makes it easier for the few SEOs who have figured out what actually works to rank their sites and their client’s sites. The moral of my story is that it is unwise to believe what those you can’t trust preach. If you want to take someone’s advise (and I do recommend that) make sure the advisor is telling you the truth. Even better, test the things you know how to test for yourself and then decide who you can trust. Those who are trustworthy always know who else can be trusted – and THAT is why I continually recommend those who are most brilliant at what they do WHEN they are highly ethical too. oh thanks dude but I am searching for more information about no-follow . if I use no-follow blogs is this affect my site pr or just a waste ? .-= data centre australia´s last blog ..Hot Aisle versus Cold Aisle Containment =-. Links from any quality site might be useful. Only the search engines know for sure how they rate various types of links and use them in their algorithms. Look at comments a different way: as a way to raise visibility for who you are and what is important to you and gain direct traffic as well as to improve your positions in the search engines. Yes, I agree – that is very funny. I guess after reading your blog daily they just assume they know you well enough to call you dude! I get that a bit too. Makes me smile. Thanks for pointing that out. Mine personally highlights them blue. I use a different tool to check. There are most likely many other useful tools; I just hope everyone realizes that offering free tools is one of the most common methods for distributing SpyWare, AdWare and ParasiteWare. If anyone knows the best independent ways to protect against AdWare, SpyWare and ParasiteWare please post links in the comments here. I am particularly interested in hearing about the best options for Ubuntu and know that many others need them for Windows or Mac. .-= growmap´s last blog ..Verifying What is Do Follow versus No Follow =-. Great info Gail, as always, that tool is so useful for so many purposes, and I use it all the time. .-= JR @ Internet Marketing´s last blog ..Make Money Online for Free: How-To Build Money Sites Quickly With WordPress =-. Great to hear from you again. I know by your absence that you are just as busy all the time as I am. Thanks for commenting in this post. I’ll be around to visit your blog very soon. This is good to know. It’s difficult to tell if you’re on a dofollow site sometimes. Now this little check will save a lot of time. I downloaded the SEOBook toolbar a few weeks ago but have only started to use features other than the links, alexa and the rank checker tool that you pointed out in another post. Good stuff! .-= Tim from Classic Car Auto Insurance´s last blog ..Collector Car Insurance Application Hints =-. Good to see you here again Tim. Yes, it is difficult and especially if you try to look through source code. It is no wonder Will thought we were nofollow with all the nofollowed tags on unimportant links on our page. I use the SEOBook toolbar all the time and wish I had the time to take advantage of Aaron Wall’s SEOBook Training. Maybe some of my readers who want to learn SEO and have more time than I currently do will join and write some how-to posts either in their own blogs or as guest posts here. I would love to publish more guest posts from my readers. The video at that link mentions ppc training. I don’t know what they’re recommending but I can not recommend PPC Summit highly enough. Anyone using pay per click advertising should seriously consider attending if you can. Do check out my two ppc posts How Not to Lose Your Shirt on PPC and How to Evaluate Your AdWords Account. Two more tips: insurance and mortgages are two areas where you can REALLY lose your shirt trying to buy traffic. Be VERY careful and don’t even attempt to buy any generic keyword phrases. I can share more experience on that subject should anyone need it. The other tools Tim mentioned are explained in my How to Track Search Engine Positions post. I greatly feel comfortable and find it convenient using the Firefox browser. And I found the Firefox add-on ‘SearchStatus’ (I feel many is already aware of this add-on) to be fully effective and very much handy in highlighting the nofollow links in a webpage. It uses pink colour to highlight the nofollow links. Apart from highlighting the nofollow links, it also has many other features for analysing a website and its pages. .-= Rajib@Love Quotes´s last blog ..Come back to me.. =-. Always read the reviews BEFORE you download anything. See the reviews for Search Status FireFox AddOn. Thanks for informing. I will surely check it out, see reviews and then think whether to uninstall it or not. Be sure to read the rest of the comments in this thread. It appears that all the common tools for identifying links that have been nofollowed report our movements. Search Status is no different in this respect so if we want the functionality we have to accept what the tools do. Yes, I have been tracking the rest of the comments. I will definitely reconsider using the plugin. Will try experimenting with the other ones which you have mentioned and which others have commented upon. More than a year ago, Google changed how the PageRank flows so that the five links without nofollow would flow one point of PageRank each. Now, that is not to say that we should ignore that attribute all together but to simply help people understand that even if link has rel=nofollow set – you still get some juice! .-= Alex Sysoef @WordPress Guides´s last blog ..3 Webmaster Tools To Improve Blog Performance =-. Thank you for taking the time to share that link and your input here Alex. What I do and recommend is based on what is for the greatest good. If we allow Corporations to dictate our behavior we are allowing them to control us. I prefer to do what is right. If more individuals would do the same and make it a point to use and support independent businesses and service providers we would have far more options and individual freedoms. A great place to start is to use and recommend alternative search engines. DuckDuckGo is my current personal favorite search engine. I have yet to find anything in a major search engine that I can not find in theirs except for all the junk sites like they filter out. Here is more about why they’re a better search engine. We as bloggers can make a difference in our economy by championing the best ideas and recommending quality businesses and services. I hope more bloggers will join me in making the world a better place. Anyone interested in understanding better what I mean by that can read the MEME Bizluv post featured in this reply. Thanks to you for this wonderful lesson you posted here for your readers.your tool seems wonderful and useful too.definitely try this first and let you know the results.anyways please keep updating on this topic.looking forward for more updates. It isn’t actually “my” tool – it is Aaron Wall’s and perhaps other collaborators of his. It has far more uses. I wrote about How to Use RankChecker and I will write about others I use in future posts. One tip for new bloggers: if you get bored and decide to change your layout, or which blogging site you use, make sure to change the links back to dofollow. Most blogs nowadays are automatically set to nofollow! That is another reason I wrote this post. Far more people now know how to look at nofollow but that doesn’t help them if they don’t realize why many sites that are dofollow have so many nofollowed links. You are absolutely correct that almost all blog platforms and Themes default to nofollow so you if you want to support do follow you have to proactively change the links in question. +1 vote for SEO toolbar. It’s a handy tool to have around if you want to quickly check websites for marketing purposes. The DoFollow highlighter used to be on by default but nowadays if you just download it for the first time, you have to turn that feature on. Being able to toggle the red highlighting off is a good thing as red is not the easiest color to read through. I hope you’ve taken the time to read some of my other posts. For any geographically local business I particularly recommend maximizing your listings in Local Search Directories. There are many more posts that would benefit you here. The most important eventually end up in the Best eMarketing Practices Best of GrowMap page. Great post. I definitely was curious about this. I thought for a while that CommentLuv meant that comments were dofollow, but it is not the case. Thanks for the clarification! I am sure many people believe that all sites using CommentLuv or KeywordLuv are dofollow but as you have seen that is not necessarily so. When I create lists and recommend sites I only include those that are actually dofollow. Obviously that can change so those who care need to verify and I will edit links when notified that they appear on any list I maintain and they are no longer dofollow. Whether to support dofollow is a choice each site owner makes; I am firmly in support of do follow because I believe it is the right thing to do. Those interested in debating that or reading more on the subject should visit the KeywordLuv post I’ll use in CommentLuv in this reply.